Logon Triggers are special kind of Stored Procedure or an operation that gets executed automatically in response to a LOGON event. They get executed only after the successful authentication but before the user session is established. If authentication fails the logon triggers will not be fired. Caution! : Logon Triggers are very useful feature, but a small mistake in the Logon Trigger may cause database server un-accessible to any user including SA user. For example in a Logon trigger you are referring to a non existent table or database will allow you to create it. But once it is created then no one will be able to connect to the server as Logon trigger errors out. So it is best advised to check whether you are able to establish a Dedicated Administrator Connection (DAC) with SQL Server Management Studio. Because in case you have created a wrong trigger and not able to to connect, then DAC connection comes for your rescue. As the DAC connection will not trigger the LOGON trigger execution and you will be able to connect to Sql Server and after connecting disable the incorrect trigger. EXAMPLE 1: This example Logon trigger blocks the user TestUser from connecting to Sql Server after office hours. From the above image we can see that the TestUser was able to have two concurrent new query sessions, but the attempt to open the third session is blocked by the trigger. In the above example trigger you can observe that, during trigger creation I have added the clause EXECUTE AS ‘sa’. The reason for this is only the users with VIEW SERVER STATE permission on the server can see all the executing session on the instance of Sql Server. And the users who don’t have this permission can see only the current session. Because of this I am executing the above trigger as ‘sa’. An alternative option for this is grant TestUser the VIEW SERVER STATE permission using GRANT VIEW SERVER STATE TO TestUser statement. Data Definition Language (DDL) Triggers are special kind of Stored Procedure or an operation that gets executed automatically when a DDL Statements like CREATE, ALTER, DROP, GRANT, DENY, REVOKE, and UPDATE STATISTICS statements are executed. Certain system stored procedures that perform DDL like operations can also fire DDL triggers. DDL triggers can be DATABASE scoped or SERVER scoped. The DDL triggers with Server level scope gets fired in response to a DDL statement with server scope like CREATE DATABASE, CREATE LOGIN, GRANT_SERVER, ALTER DATABASE, ALTER LOGIN etc. Where as DATABASE scoped DDL triggers fire in response to DDL statement with DATABASE SCOPE like CREATE TABLE, CREATE PROCEDURE, CREATE FUNCTION, ALTER TABLE, ALTER PROCEDURE, ALTER FUNCTION etc. Who has fired the DDL statement. For example we may be interested in identifying who has dropped the table. 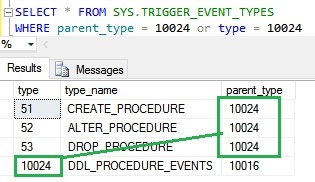 In the above example trigger, the trigger action DDL_PROCEDURE_EVENTS is an aggregate event name for the individual trigger event names: CREATE_PROCEDURE, ALTER_PROCEDURE and DROP_PROCEDURE. The system stored procedure SYS.TRIGGER_EVENT_TYPES lists out all the trigger events. 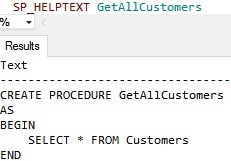 The below query explains that the DDL_PROCEDURE_EVENTS is an aggregate event name for the individual trigger event names: CREATE_PROCEDURE, ALTER_PROCEDURE and DROP_PROCEDURE. 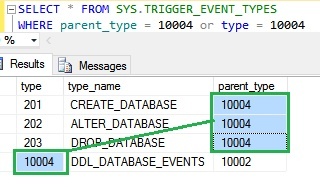 In the above example trigger, the trigger action DDL_DATABASE_EVENTS is an aggregate event name for the individual trigger event names: CREATE_DATABASE, ALTER_DATABASE and DROP_DATABASE. The system stored procedure SYS.TRIGGER_EVENT_TYPES lists out all the trigger events. 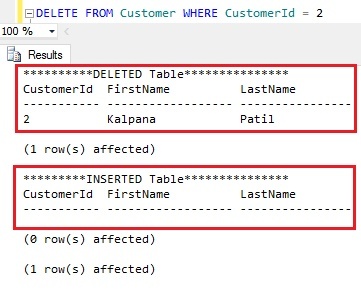 The below query explains that the DDL_DATABASE_EVENTS is an aggregate event name for the individual trigger event names: CREATE_DATABASE, ALTER_DATABASE and DROP_DATABASE. Let us check whether apart from adding to the audit log table: LogDDLEvents, the Stored Procedure is created or not by executing the following statement? Data Manipulation Language (DML) Triggers are special kind of Stored Procedure or an operation that gets executed automatically when a DML operation like INSERT, UPDATE OR DELETE is fired on a Table or View. AFTER Triggers are executed after the DML statement completes but before it is committed to the database. AFTER Triggers if required can rollback it’s actions and source DML statement which invoked it. Note in the above example just to make the understanding simple, in the Trigger just written a PRINT statement. In real world we don’t write triggers to return some message or results. They are useful for various aspects like: i) Auditing the data changes (i.e. log the changes to the table data in an audit table) ii) Enforce business rules and data integrity etc. A table can multiple AFTER triggers and for the same trigger action too we can have multiple triggers. From the above result we can see that the AFTER trigger which is created in Example 1 (i.e. AfterTriggerExample1) and another AFTER trigger which we created in this example (i.e. AfterTriggerExample2) are executed when we try to insert a record in the Customer table. As both these triggers are configured to execute for the trigger action INSERT on the Customer table. If a table has multiple AFTER triggers, then we can specify which trigger should be executed first and which trigger should be executed last using the stored procedure sp_settriggerorder. All the other triggers are executed in an undefined order which can’t be controlled. 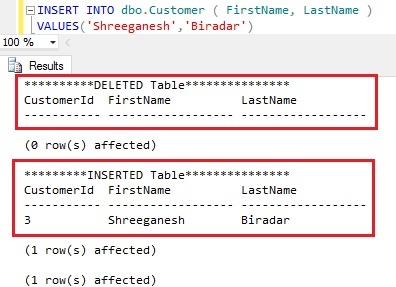 DML Triggers have access to the two special logical Tables named INSERTED and DELETED, these are the temporary tables whcih Sql Server manages. These tables structure will be same as that of the table on which the DML action is fired and holds the old and new values of the rows which are modified by the DML statement. DELETED logical table will hold the rows which are delted from the trigger table (i.e. the table on which the trigger is defined) by the DELETE or UPDATE operation. An UPDATE DML operation is internally executed as first the deletion of the existing record and then insertion of the new record. INSERTED logical table will hold the rows which are inserted by the INSERT and UPDATE statement. INSTEAD OF Triggers are the triggers which gets executed automatically in place of triggering DML (i.e. INSERT, UPDATE and DELETE) action. It means if we are inserting a record and we have a INSTEAD OF trigger for INSERT then instead of INSERT whatever action is defined in the trigger that gets executed. 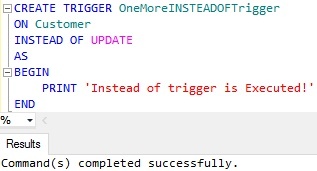 From the result we can see that INSERT statement triggered the execution of the INSTEAD OF trigger instead of inserting the record into the Customer table. Cannot create trigger ‘AnotherINSTEADOFTrigger’ on table ‘Customer’ because an INSTEAD OF INSERT trigger already exists on this object. Trigger is a Special kind of Stored Procedure or an operation that gets executed automatically when an event occurs in the database. DML triggers are executed when a DML operation like INSERT, UPDATE OR DELETE is fired on a Table or View. DDL Triggers are executed when a DDL Statements like CREATE, ALTER, DROP, GRANT, DENY, REVOKE, and UPDATE STATISTICS statements are executed. Certain system stored procedures that perform DDL like operations can also fire DDL triggers. Logon Triggers gets executed automatically in response to a LOGON event. They get executed only after the successful authentication but before the user session is established. If authentication fails the logon triggers will not be fired. CLR Triggers are based on the Sql CLR. We can write DML and DDL triggers by using the Supported .NET CLR languages like C#, VB.NET etc. CLR triggers will useful if require heavy computation in the trigger or require reference to object outside SQL. Data Manipulation Language (DML) Triggers have access to the two special logical Tables named INSERTED and DELETED. 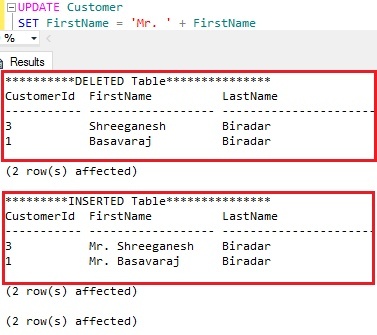 These are the temporary tables managed by Sql Server. Structure of these tables will be same as that of the table on which the DML action is fired and holds the old and new values of the rows which are modified by the DML statement. DELETED logical table will hold the rows which are deleted from the trigger table (i.e. the table on which the trigger is defined) by the DELETE or UPDATE operation. An UPDATE DML operation is internally executed as first the deletion of the existing record and then insertion of the new record. Execute the following INSERT statement to insert the record into the Customer table. Execute the following DELETE statement to DELETE a record from the Customer table. Execute the following UPDATE statement to update all the records from the Customer table.